simple life really can be, and just how complicated humans have now made their own lives. Are you missing out on the good news? 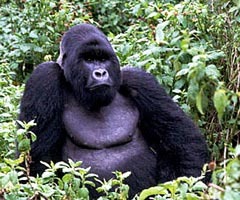 Silverback Mountain Gorillas are the largest primates. They are ground-dwelling and predominantly herbivorous. They are social and live in individual Mountain Gorilla families. They inhabit the forests of Central Africa and are divided into two species and either four or five subspecies. The DNA of gorillas is extremely similar to that of a human, between 95 and 99% depending on what is counted, and they are the next closest living relatives to humans after the two chimpanzee species. Meeting these docile mountain gorillas is a unique and awe inspiring experience which is not found anywhere else in the world, leaving you with life-long memories. c) Airport transfers to the forests and guide for various other tours. 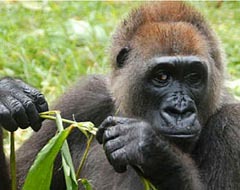 Gorillas' natural habitats cover tropical or subtropical forests in Africa. Although their range covers a small percentage of Africa, gorillas cover a wide range of elevations. Lowland Gorillas live in dense forests and lowland swamps and marshes as low as sea level, with Western Lowland Gorillas living in Central West African countries and Eastern Lowland Gorillas living in the Democratic Republic of Congo near its border with Rwanda and Uganda. Gorillas are undeniably the most unique primate that survives in the forgotten forests of the Equatorial jungles of Central Africa. There are four gorilla species. 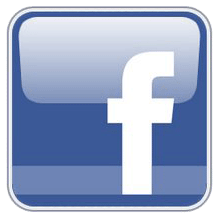 Namely the Mountain Gorillas, Western Lowland Gorillas, Eastern Lowland Gorillas and the rare Cross River Gorillas. All are labelled either endangered or critically endangered. Within these species variations can also be found. Mountain Gorilla families are led and protected by a dominant male known as a “silverback gorilla.” Aptly name for his silver "saddle". Although mountain gorillas are frequently portrayed as aggressive, dangerous killers, perhaps due to Hollywood films, conversely they are social animals that are rather shy, peaceful vegetarians that are active during the day. This point was originally proven by Dian Fossey when photographs showing the gorilla "Peanuts" touching Fossey's hand depicted the first recorded peaceful contact between a human being and a wild gorilla. Male gorillas are much larger than the females, and are almost twice as heavy. Adult male mountain gorillas are called silverbacks because they have a saddle-shaped patch of silver hair on their backs after they have reached about 12 years of age. Female gorillas carefully nurture their young. Baby gorillas learn to crawl at about 2 months and can walk before they are 9 months old. They can grasp their mother's fur to ride on her back at 4 months. Baby gorillas are fed mother's milk for the first 2 1/2 years of life. When they are weaned, gorillas begin to build their own sleeping nests out of vegetation (and not use their mother's nest anymore). 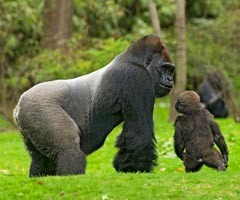 Young gorillas stay with their mother for 3-4 years. 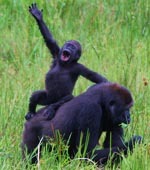 Adult male gorillas (silverbacks) will care for weaned orphaned young. Mountain gorillas have coloration and facial features that are quite different from the lowland gorillas and other species. The mountain gorilla has noticeably more hair to protect it from the colder mountainous regions where they live and is the one species that seldom lives successfully in captivity. 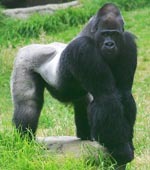 The male known as the Silverback Mountain Gorilla is identified by the silver saddle on his back and hind legs. If restrained in a zoo they will not breed and will eventually die. Hence the mountain gorilla is the most sought amongst tourists on gorilla trekking safaris in Rwanda and Uganda.. In contrast to the six billion human beings living on our crowded planet, there are only some seven hundred mountain gorillas left on the borders of Uganda, Rwanda and Congo. The late Dian Fossey dedicated 18 years of her life to researching and studying these Mountain Gorillas. Dian was also very instrumental in fighting back at the poachers, who have been known to kill and entire family of 30 gorillas to be able to capture two babies for a European Zoo !! Western lowland gorillas are also on the endangered species list, but they remain far more common than their relatives, the mountain gorillas. They live in heavy rain forests, and it is difficult for scientists to accurately estimate how many survive in Cameroon, Central African Republic, Congo, Equatorial Guinea, Gabon, Angola, and the Democratic Republic of Congo. Western lowland gorillas are currently more numerous than mountain and eastern lowland gorillas combined and their population is estimated at between 150000 & 200000. 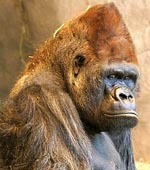 Gorillas are the largest primates in the world, and Grauer’s is the largest of the four gorilla types. Males can weigh more than 500 pounds and stand erect at 2 meters. There are approx only 4500 in the wilds. As large forest mammals that feed predominantly on vegetation, they have an important influence on the natural composition of plant communities. With only 200 in their entire population, the Cross River gorilla is rarely photographed in the wild. 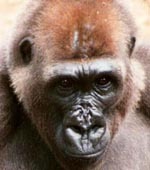 Once thought to be extinct, this unique subspecies of gorilla “resurfaced” in the 1980s and is found only along the southern section of the Nigeria-Cameroon border. Preferring habitats of low- and mid-elevation rainforest and mountain forest, the remaining Cross River gorillas live in roughly 11 subgroups dispersed amongst the region’s highland areas. 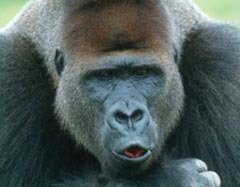 One of four known subspecies of gorilla, Cross River gorillas most closely resemble western lowland gorillas but differ in the dimensions of their skulls and teeth. Researchers have also recognized a number of socio-ecological distinctions. Like other gorillas, the Cross River gorilla reproduces slowly, with females giving birth only once every four to five years. Since their estimated numbers hover at fewer than 300 individuals, this critically endangered species depends on conservation efforts and law enforcement for its survival. US Dollars are widely accepted. Credit cards are accepted in major towns. The forest can often be wet and sometimes cool in the damp atmosphere. A light weight water proof jacket is advised. Good walking boots / shoes with long socks. Jeans can be tucked into your long socks to keep out any red ants while mountain gorilla trekking. Some areas of the forests also contain thistles / stinging nettles which can irritate the skin of the hands and arms when brushed against. We suggest long sleeve shirts and either a pair of light gardening gloves or a pair of socks pulled up over the hands and arms will suffice. Your boots will get muddy and we suggest you bring two small plastic bags to repack your boots in to protect your clothing from getting dirty in your case. A small back pack is ideal for cameras, water bottle etc. 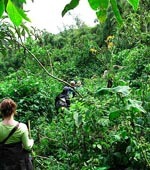 leaving your hands free to negotiate the bush that you will be walking through. A reasonable level of fitness is recommended as you will be trekking through thick forest and you will also experience some gentle climbing. Though viewing is limited to one hour there could be a few hours trekking mountain gorillas before finding their current location. You should be free of colds / flue etc as gorillas are not immune to human diseases. Travel insurance is always recommended (medical cover etc). If required can be obtained on arrival at the airport. 220 Volt - European round two-prong plugs and square 3 pin plugs. To protect and conserve the Mountain Gorilla approximately only 70 Gorilla permits are issued each day, allowing for one hour viewing with a gorilla family, this affords the gorillas the least disturbance to their lives. With this in mind it is imperative to plan and book your gorilla trekking safari experience in either, Rwanda or Uganda well in advance.